The Return of Top Chef Night | Eat.Drink.Life.Love. We are celebrating the triumphant return of Top Chef Night with a new season of Top Chef and lots of cooking. (yay!) BUT, you’ll notice things are a little different around here. Why? * I’m proud to report that the business I’ve been building and growing for nine years is having the best year ever! I’m consistently busy writing and managing social media and getting busier every day. A huge accomplishment that, sadly, cuts into my own personal blogging time. 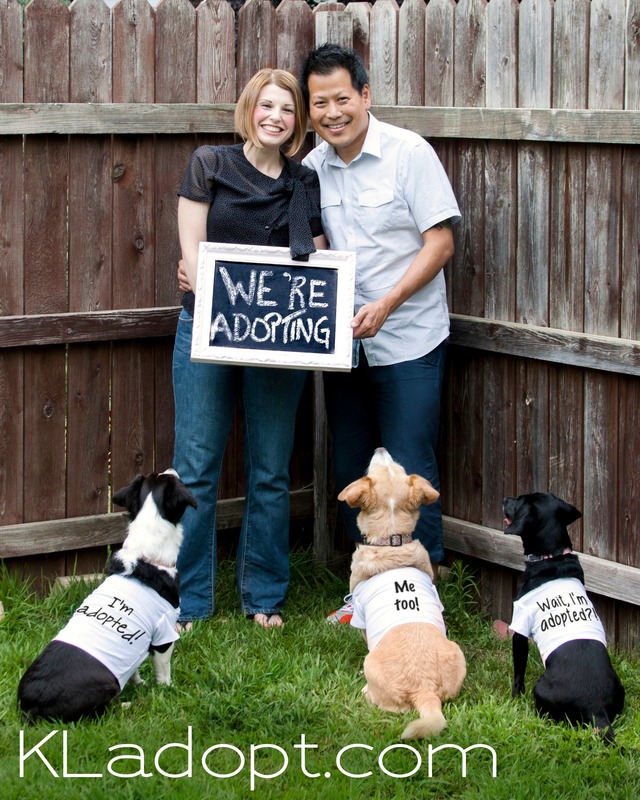 * In even bigger news … K and I are adopting a baby! I will not be turning this into an adoption blog! But, as you may imagine, the process of preparing for adoption and (hopefully soon) a baby, is taking up a fair amount of time as well. 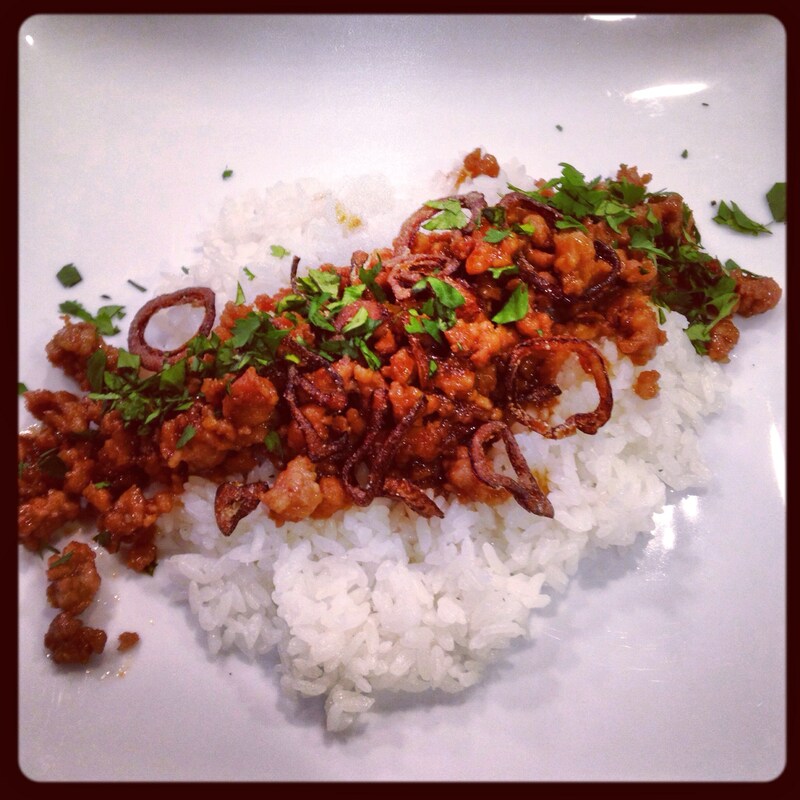 From chef Mei Lin’s winning pork belly and congee porridge we interpreted caramelized soy pork over sushi rice with crispy shallot rings. While our “onion rings” were a little bitter (I sliced them too thin and didn’t use enough rice flour to coat them), this whole meal was quick and really delicious. 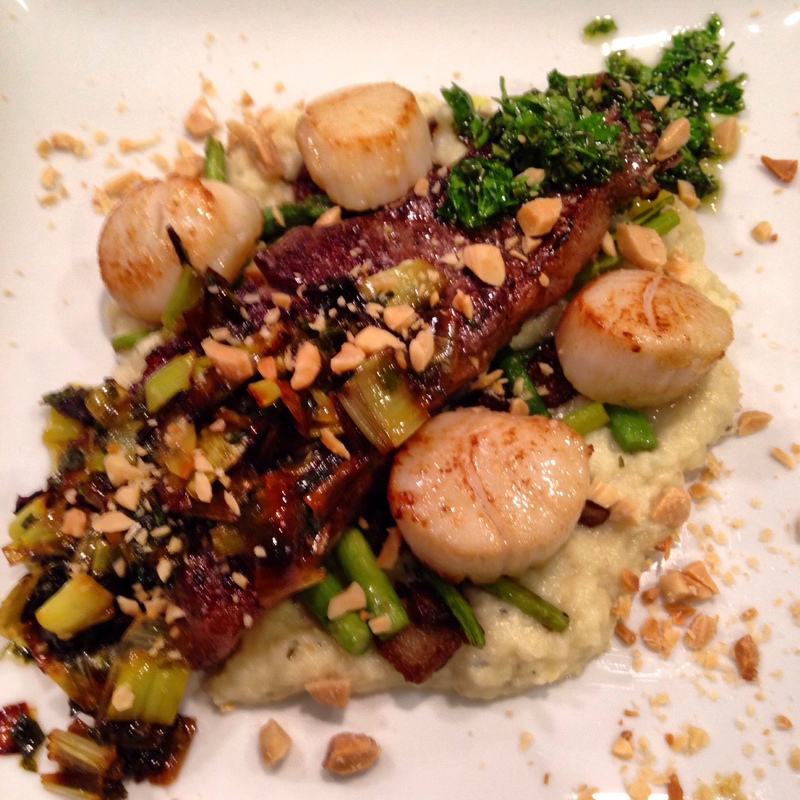 We made chef Gregory Gourdet’s winning “surf and turf” dish with parsnip puree, grass-fed New York strip, seared scallops, mushroom and asparagus ragout, chive and parsley oil with Marcona almond leek vinaigrette. The photo is blurry because I was in a REAL big hurry to eat this and we inhaled every bite. That vinaigrette — we will *definitely* make that again. Bold, balanced and versatile. Another win for chef Gregory (and for us). 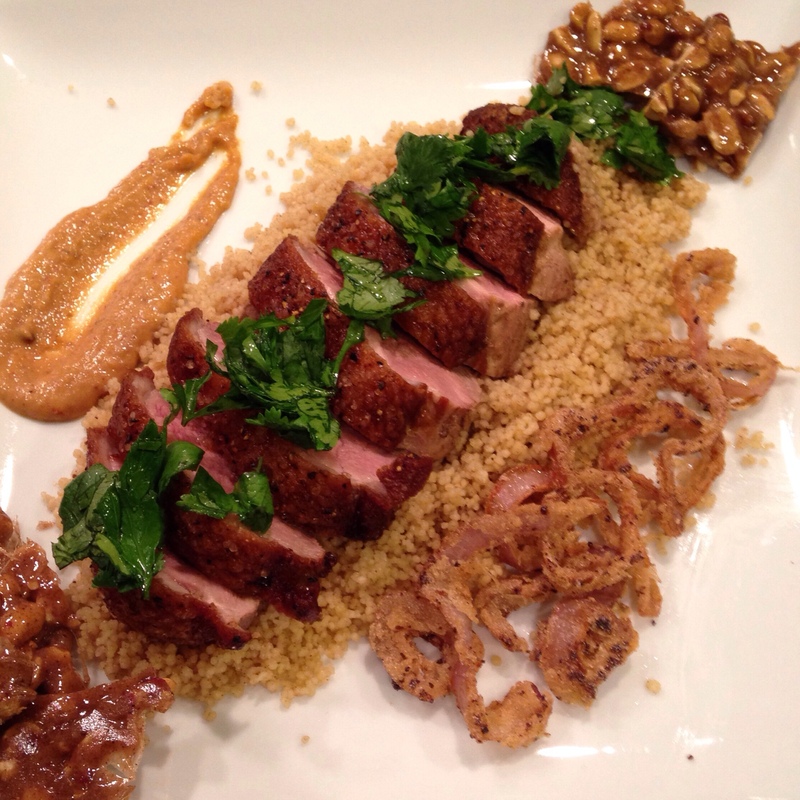 Seared duck breast, garam masala couscous, peanut nam prik pao (roasted chili sauce), crispy shallots, herb salad and a savory five spice peanut brittle. So good, so rich. We were skeptical about the sauce, but it was roasty with a good amount of smoky heat. This was my first attempt at peanut brittle and I was sure it didn’t work because the hot mixture did not bubble when I added the baking soda. But it was delicious — a little spicy, just the tiniest bit sweet, lots of interesting flavor. Also, totally superfluous with this dish. P.S. Don’t tell K, but I used his fancy meat thermometer to pinch hit for a candy thermometer (which we do not have). Stay tuned! We’re back, we’re cooking and we’ll be sharing more “restaurant food” made accessible to home cooks as we can!